At first glance, Olivier Cousin can give a gruff impression. His grizzled grey beard, muddy rubber boots, and subdued demeanor suggest a man who seems to rise right out of the earth, plants and vines he cultivates. After a week of staying with Olivier and his family, and talking with him, what I discovered instead was a caring man, deeply connected to the people in his life– a very centered presence in a world often filled with commercialism and dollar signs. In many ways the experience of staying with Olivier represents a return to the old ways of the world, as does drinking his wine. It would be difficult after this trip to readjust to the outside world. Olivier explained to me that he considers his vineyard to be a garden, and he cultivates it with the care one would cultivate a small and very treasured patch of tomatoes. Like all good biodynamic farmers, he does not believe in monoculture. We experienced this bounty first-hand in the food we ate every day. Lettuce from the garden every night for dinner, blood sausage he made himself, and chickens killed and roasted the same day. Olivier believes biodiversity is essential to a healthy soil and therefore healthy plants and vines, and to a healthy planet. You may have heard about the horses Olivier uses to cultivate the soil. Olivier doesn’t use horses to plow because it makes better wine (although it does). He uses them because he simply likes working with animals. He told me he’s just not interested in working with heavy machinery, he finds it much more pleasant to work with an animal. It’s not a question of expense either, he said there’s no difference in cost. He does say one must spend more time to use the horses, but he does so gladly because the connection with animals is important to him. He also spends his time helping other winemakers learn how to work with horses, and has spawned a whole crop of disciples who prefer to work as he does. So why are horses better than tractors? There is a debate raging right now amongst biodynamic and organic winemakers on whether plowing is a good thing. 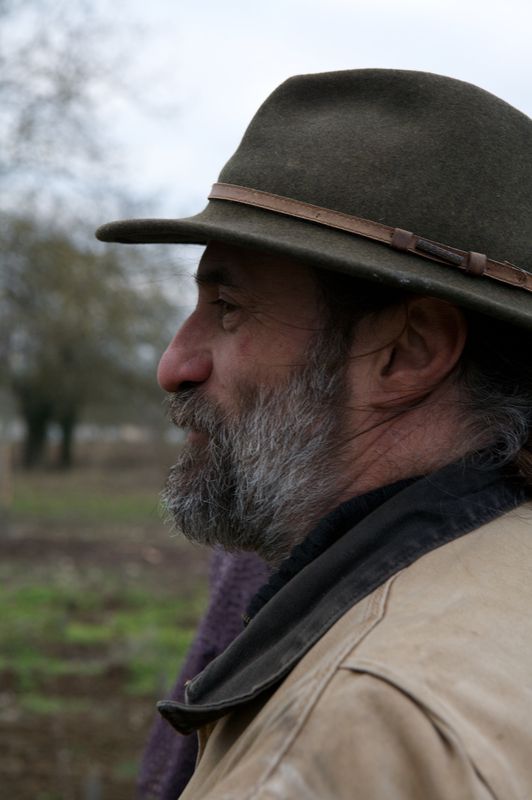 Olivier falls into the camp that believes plowing is an essential part of good winemaking. For him, worms and their castings must be able to do their work on the land. When you don’t use herbicides and pesticides, the soil is full of nutrients on which the worms can feed, but he thinks you really need to churn up the earth between the vines to give them space to burrow. Plowing also cuts the surface roots of the vines, encouraging the main roots to dive deep down into the earth, making for a better-implanted vine and a better exchange with the soil. Roots that are well implanted also lead to a vine that can survive difficult years. For example, in a hot year the vine can access humidity deep down under the earth, whereas a vine whose roots are spreading out near the surface waiting for rain will suffer during a hot year, and have a more negative effect on the balance of the grapes. Olivier cultivates winemakers and harvestsers the same way he cultivates his vines. His domaine is like a revolving door through which natural winemakers and those interested in working the land continually cycle in and out. Not a day went by a new winemaker or intern didn’t pop in, always with a gift of wine, or once a batch of freshly made chevre cheese. They would sit and eat with all of us, chatting and drinking with Olivier long into the night. People seem to come from far and wide in France to learn from Olivier, intrigued by his connection to the land and animals, hoping perhaps to capture some of the magic bottled in his wine. Olivier gives his time freely and with pleasure, because he enjoys getting to know new people. After speaking with Olivier for the better part of a week, I began to realize there’s something different about him. In a way everything seems backwards compared to the fast paced, materialistic world of New York City wine business. Again and again he would return to ideas that pointed this out. When he spoke of the harvest, he told me that he felt the entire year was a rehearsal for the concert that the harvest would become. He stressed that this concert’s purpose was not to make wine. The real thing they were practicing for was to make the experience the most pleasant possible, for everyone involved. They want to bring together a team that enjoys working the land. Sure they make wine as a result, but Olivier said that he feels too many winemakers are excited to make the wine just so they can sell it and make money. He thinks they focus too much on the final product, and lose site on simply enjoying the whole process. He sees the concert as the most important purpose, and the wine is a byproduct of that concert. He told me he sells his wine in the States and other places, like Japan, not because he can maximize his profits, but because he enjoys visiting those lands and connecting with those that sell and buy his wine there. When you take a step back and look at the whole of Olivier Cousin’s life, you see something quite remarkable. Here is a man who spends most of his time doing something with which he feels an intense connection. Whether it’s working with his animals; tending to the earth, plants and vines; or meeting and enjoying the company of winemakers, interested interns, wine buyers and customers; he seems to be focused on things he enjoys doing. His natural pleasure of life radiates so much that people come from far and wide just to experience it first-hand. He doesn’t have to work to sell his wine, it sells itself once you taste it. Isn’t this something we all aspire to?